Last week the Devizes Area Final of the Rotary Young Chef Competition 2018-19 took part at the fabulous Farm Cookery Schoolnear Bromham. Devizes Community Area Wellbeing Day is a big hit! 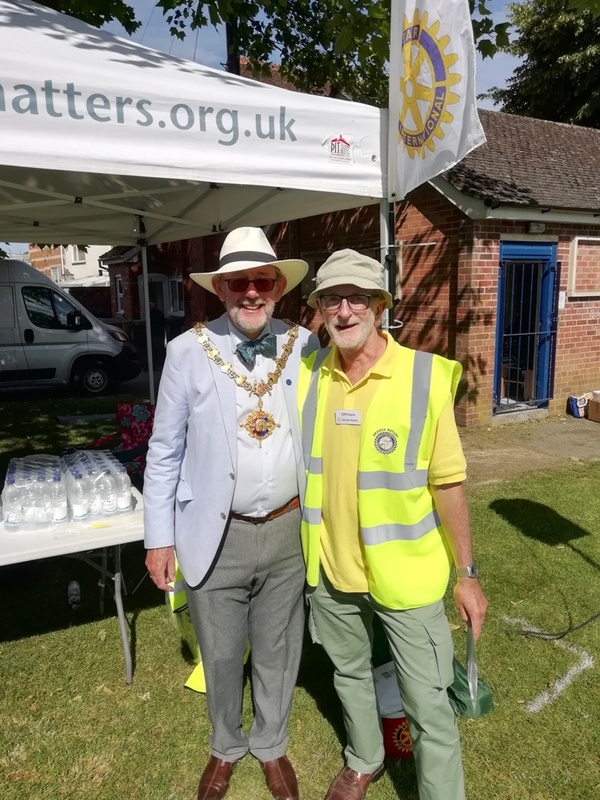 As stated in this week’s Gazette and Herald – click HERE to see the article – the Devizes Community Area Wellbeing Day, which was held last Saturday (23rd June) and was organised by Devizes Rotary working in partnership with the Devizes Communty Area Wellbeing Group, was a big hit! 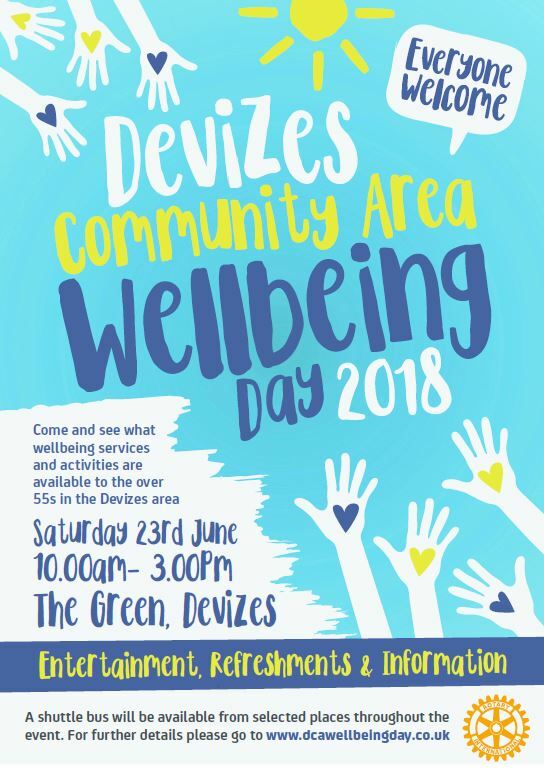 Devizes Rotary, working in partnership with the Devizes Community Area (DCA) Wellbeing Group, is hosting the inaugural DCA Wellbeing Day on Saturday 23 June 2018 from 10am to 3pm on the Small Green in Devizes. The aim of the day is to provide free entertainment and information to the over 55s in the area. Around 30 exhibitors will be there to explain to visitors what services and activities are available to them, and there will be a demonstration area showing activities such as poppy making and walking sports. Vintage music will be played throughout the day, and there will be a dog show in the main arena run by Vets4Pets. So, if you are over 55, or know or care for someone who is, why not come down to The Small Green from 10am to 3pm on 23rd June and find out what is happening locally? There are so many activities in the Devizes area that you may not realise are available, so it will definitely be worth a visit. The Devizes Rotary SuperChoir 2017 concert will take place on Wednesday 12th July 2017 at Dauntsey’s School. Pupils from Soutbroom St James Academy, St Nicholas VC Primary School, The Trinity CE Primary School, Wansdyke School and Woodborough CofE School will sing together on the main stage between 18:30 and 20:30, and once again all participating schools will receive a Devizes Rotary SuperChoir banner and plaque, plus each member of the choir will receive a special commemorative t-shirt to be worn during the performance. From L-R: Amy Whitlock (Music Teacher) members of the Southbroom School Choir, Cliff Evans (President of Devizes Rotary). Simon May, one of the foremost TV and entertainment composers in the UK and best known for his Eastenders theme tune, will once again be there helping out, as will Carole Berry our Artistic Director, who will conduct the choir as they sing over a dozen popular songs including Rolling in the Deep by Adele and Sing by Gary Barlow. Tickets are £5.25 each and can be obtained from http://www.superchoir.com/2017-tickets or from Devizes Books. The winning lottery tickets have been drawn, Gianni Campanello (owner of Dolcipani where the concert will take place) and Vincenzo Bua have been practising their routine, and the delicious home-cooked buffet food has been prepared, so all is now set for tonight’s very special Singing for Life Concert which Devizes Rotary Club helped to organise. Below is a copy of the poster advertising the “Singing For Life” event on 30th March that the Rotary Club of Devizes is organising in partnership with Dolcipani Italian Bakery and Coffee Shop to raise cash for the GWH Radiotherapy Appeal. If you could help publicise this event by distributing posters to pubs, shops, schools, businesses etc in your village/town please let me know. The provision of the new Radiotherapy Centre at GWH will impact a great many of us either directly or indirectly, so please also encourage your friends and family to go to the following page – https://rotaryclubofdevizes.wordpress.com/donate/ – so that they can can buy a lottery ticket for the event, and/or make a donation directly to the Appeal. Below is an article which appeared in the Gazette and Herald this week outlining the Devizes Rotary Club plans for supporting the Great Western Hospital Brighter Futures Radiotherapy Appeal. CAFE owner Giovanni Campanella, who was diagnosed with cancer nearly two years ago, is staging a music night to raise money for a cause close to his heart. Mr Campanella, who runs Dolcipani Italian bakery and coffee shop in Devizes, has joined forces with Devizes Rotary Club to collect money for the Brighter Futures Appeal at Great Western Hospital, Swindon, on March 30. Devizes Rotary Club president Cliff Evans said: “It’s a privilege for the Rotary Club of Devizes to have been invited by Giovanni to help organise the event, and thereby raise much needed money for the GWH Radiotherapy Appeal, which currently stands at £1.3m of a £2.9m target. For every £14 donated, the donor’s name will be entered into a lottery to win one of just 30 exclusive places at the unique concert, and because Dolcipani is covering all costs, every penny of their donation will go to the appeal.” Those who donate but do not win a ticket will get a free cup of coffee on their next visit to the cafe. Among the guests on the evening will be Mr Campanella’s consultant Dr. Omar Khan. Mr Campanella is no stranger to performing as he was a regional finalist on Britain’s Best Bakery in 2014 and also appeared on screen with the late Terry Wogan when he visited Devizes for Terry and Mason’s Great Food Trip. He will be preparing a finger food buffet for the evening which will feature Mr Campanella singing and on guitar and Mr Bua providing vocals and bass.